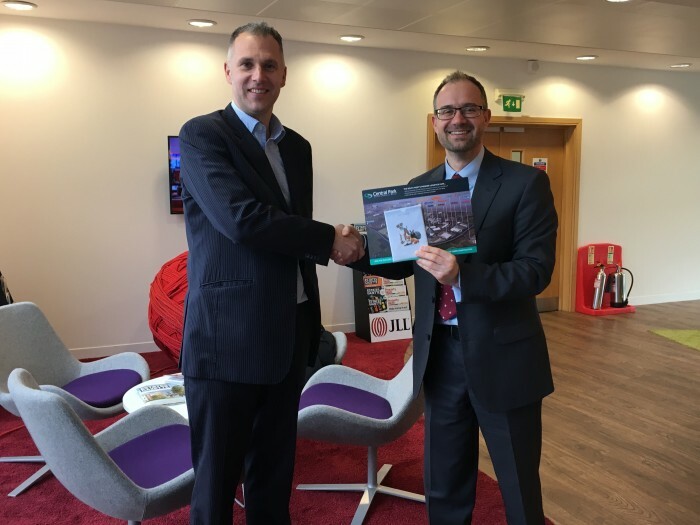 The lucky winner of our recent ‘spot the truck’ quiz was Richard Harris , a Director in the JLL Leeds office industrial team. With over 100 entries received for this competition , the odds were high , so well done. Richard won a prize of £200 in John Lewis vouchers , presented here by Rob Oliver at GVA. To get the answer , entrants were required to study our recent drone footage of the new ‘The Range’ unit under construction ( 1.2 million sq.ft. ). Further competitions are to follow so watch the Central Park web site and our further mailings in 2017.